A seed or world seed is a combination of letters and numbers used to specify how a terrain is generated when creating a new world in Minecraft. Since a seed is the basis for how a world is generated, using the same seed will generate the same terrain. You can use the command /seed to display your current world seed. Do note that this may not work for servers that you do not have permission to use such command. Generated worlds using the same seed on different versions of Minecraft may not be identical especially with versions that feature new biomes or a different world generation just like Minecraft 1.13 (Update Aquatic). World seeds are a feature on all editions/platforms for Minecraft (Java, Bedrock/MCPE, etc.). However, a seed can only be used on the same platform it was from. When used on a different platform or edition of Minecraft, the terrain will not be identical. A seed for a Minecraft Java Edition world will not yield the same one when used in Minecraft Bedrock/Pocket Edition. Seeds can be used in both single player and multiplayer (servers). Using a custom seed allows you to customize the generation of your world. You can get a seed from a friend or you get a seed online from forums like MinecraftForum.net and other websites for sharing world seeds. 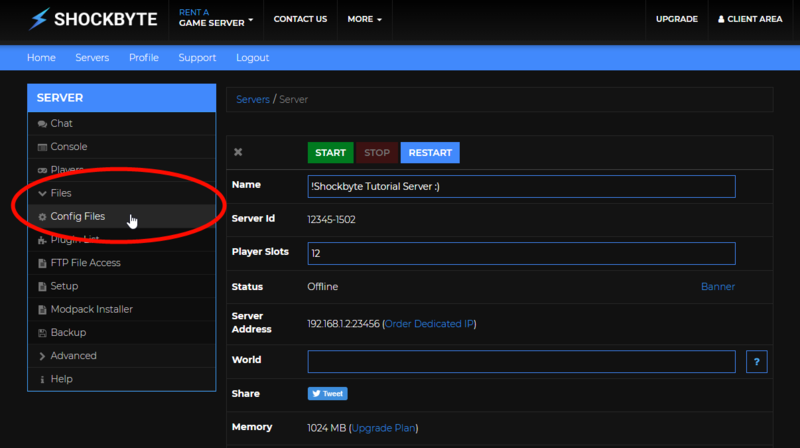 Log in to your server's Multicraft Panel (https://mc.shockbyte.com/) and stop your server. Navigate to Files > Config Files. Locate the option called Level Seed and enter the seed you would like to use. For this tutorial, we are using the custom seed -648154640804575350. After you have entered the custom seed, save the settings by scrolling to the bottom of the page and clicking on the blue Save button. Start your Minecraft server to allow for your world to generate based on the seed you have provided. If you have an existing world, you will need to reset/delete this before starting your server (How to Reset your Minecraft World) in order for a new world to be generated using your custom seed. That's it! You have successfully used a custom seed for your server's world generation. If you encounter difficulties in configuring your custom seed, feel free to contact us and we can assist you with this.